Jakhoo Temple is situated on the Jakhoo hill. To be precise, it is about 2.5kms east of the Ridge and 2455m above the sea level. The mountain is the highest peak in Shimla. The deity of the place is Lord Hanuman; hence the temple is dedicated to him. This temple invites many people from all around the globe to pay their respects, seek favors and blessings. A walk to the temple is a good trek. You can often spot monkeys swaying from one tree to another that will remind you of scenes from Jungle Book. The monkeys will never fail to impress visitors with their tactics. People who have traveled to this destination have shared many experiences with monkeys around during the journey. Some of the lessons have been positive some negative. The entire hill is home to many monkeys. Devotees feed the monkeys with fruits and vegetables after paying respects to the deity. 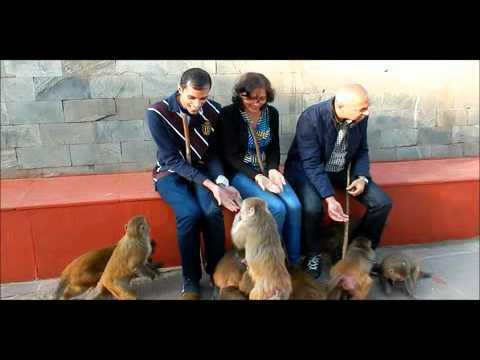 In some worse case scenarios, there are cases where the monkeys’ gang up together and attack tourists to steal away from food from them. Have you ever wondered, Why monkeys surround the place? The ancient Lord Hanuman temple on the peak is believed to be a site where Lord Hanuman paused his long journey while he was in search of a plant called Sanjeevni Booti. This plant was used to revive Lakshman when he was injured by Indrajit (Ravana’s Son). As Lord Hanuman was seated to take rest all his army men also rested along with him. However, Lord Hanuman is now the deity of the temple, and the monkey signifies to guard the safety of the premises. The name Jakhoo is derived from “Yakoo” who was a sage. Lord Hanuman witnessed him on his way to find the plant. Lord Hanuman promised sage Yakoo that he would meet him on his way back. This could not be done because of a lack of time. Later it is said that Sage Yakoo built the temple in memory of this incident. Jakhoo Temple is built around the footprints of Lord Hanuman. Jakhoo hill has two temples. One is the main temple, and the other is the rebuilt version. The first existence of the temple is not known yet. However, it is believed it has existed from the time of Ramayana. The main temple is small, and the newly built temple has a giant statue of Lord Hanuman. This statue is supposed to be the tallest in the world. The temple attracts the maximum number of devotees during Dusshera. They usually ring the bell while offering prayers as it signifies a lucky charm. How to reach the Jakhoo Temple? The temple is a short ride away from the Shimla city center. You can hire a taxi, get a pony or walk the picturesque trail of 2 kilometers up the hill to reach Jakhoo Temple. There are two options to reach the top of the temple either via rope or a cable car.